Home / County Politics, News / Shock as RUTO’s influence in Central Kenya forces UHURU and RAILA to cancel tour out of fear-This is serious! 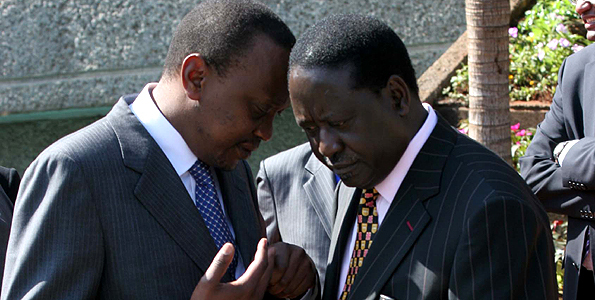 Shock as RUTO’s influence in Central Kenya forces UHURU and RAILA to cancel tour out of fear-This is serious! Friday April 12, 2019-President Uhuru Kenyatta and Opposition Leader Raila Odinga have reportedly been forced to postpone their Building Bridges Initiative popularization tour in Mount Kenya. According to sources, Deputy President William Ruto’s rising popularity and influence in Central Kenya, coupled by disquiet in Jubilee party among a section of Central Kenya leaders allied to the DP, may have been the reason why Uhuru and Raila cancelled their tour. This was corroborated James Kamau, a political analyst, who said the two leaders could be buying time for the rebellion to cool down. “We have been witnessing leaders from Mr. Ruto’s faction from Mt Kenya’s region, which is the political bedrock of Mr. Kenyatta, accuse the President of neglecting the region while they accuse Mr. Odinga of hatching a plot to divide the ruling party, a move that could have informed them to postpone the meeting,” Kamau commented. The duo deferred their visit from April and May to June.